"Pineapple-marinated pork back ribs! This recipe doubles easily for more ribs." In a large baking dish, mix together the pineapple juice, brown sugar, mustard powder, ketchup, red wine vinegar, lemon juice, and soy sauce. Season with cloves, ginger, garlic, and cayenne pepper. Cut ribs into serving size pieces, and place into the marinade. Cover, and refrigerate, turning occasionally, for 8 hours or overnight. Preheat oven to 275 degrees F (80 degrees C). Cook ribs in marinade for 1 1/2 hours, turning occasionally to ensure even cooking. Lightly oil grate. 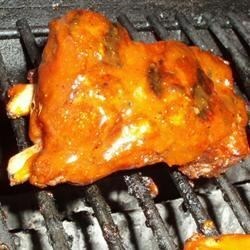 Grill ribs for 15 to 20 minutes, basting with barbecue sauce, and turning frequently until nicely glazed. This was not bad, but not our favorite rib recipe. I about split my drawers I ate so many of these! Yowza! these are fine! My wife's getting out the sewing maching cause we're have freakin good ribs tonight! Wonderful! Easy to prepare and and even easier to eat! If your store has it, I recommend you use Sweet Baby Ray's Honey Barbecue Sauce...Compliments the pineapple wonderfully. Absolutely delicious..try them, you'll love them. They take alot of time to make but well worth the effort.